What’s your menu for Thanksgiving? We’re having smoked turkey leg with a chipotle citrus glaze, chorizo cornbread stuffing with cilantro butter, Waldorf salad – tart apples, crunchy walnuts, crispy celery and tangy cranberries in a mayonnaise dressing. 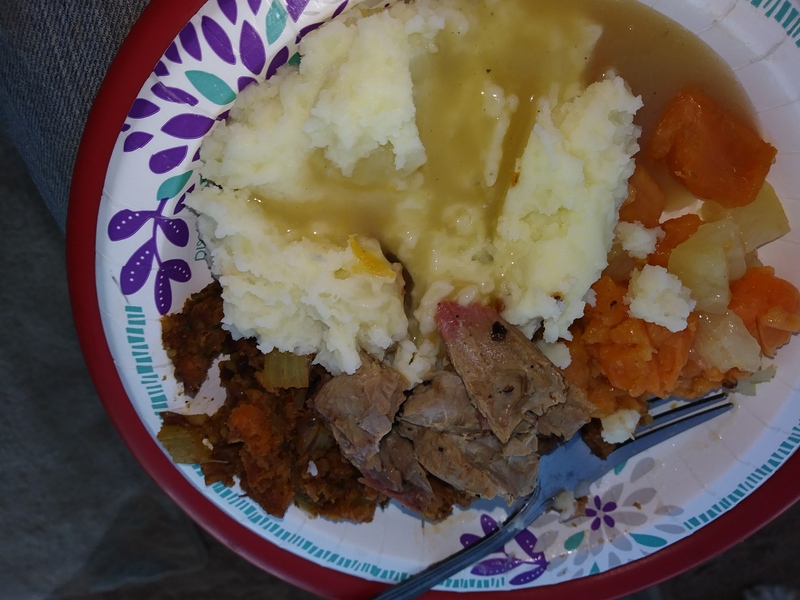 Mashed potatoes and gravy and class sweet potato casserole with pineapple, marshmallows, and pecans. Oh, and a glass or two of Chardonnay. Keep in mind we’re camping in a tent, so we’ve got a mini charcoal grill, propane stove and fire pit. Now onto smoking that turkey leg. I’ll skip the part where you catch, kill, and pluck the turkey. I mean we’re camping but we’re not primitive. Brining comes first. Bring one cup of salt and one cup of brown sugar with three cups of water to a boil. Remove from heat and let cool. Add enough ice cubes to bring the liquid measure to one gallon. If some of the cubes don’t completely melt, don’t worry about it. This step – the ice – is important. You want to keep the turkey below 40 degrees at all time to prevent bacteria growth. Put the turkey leg in a plastic zip-locked bag with the brine. Place in another bag and refrigerate overnight to 24 hours. We used a separate cooler with ice below, around and on top of the baggies. There are mesquite trees all around us so why buy wood chips. Cut off dead branches. Look all the way to the end of the branch because what looks dead near the trunk could actually have live leaves at the ends. Break branches about one inch thick into 4 to 6 inch long pieces. Soak in water for at least an hour. You’re smoking the leg so you don’t want the wood to catch on fire. Start the charcoal. When coated with grey ash push the briquettes to the outside of the grill leaving the center empty. Place the soaked wood in that empty center. Remove the leg from the brine. Rinse and pat dry. Season to taste. We use chipotle powder, dried thyme, garlic and onion powder. 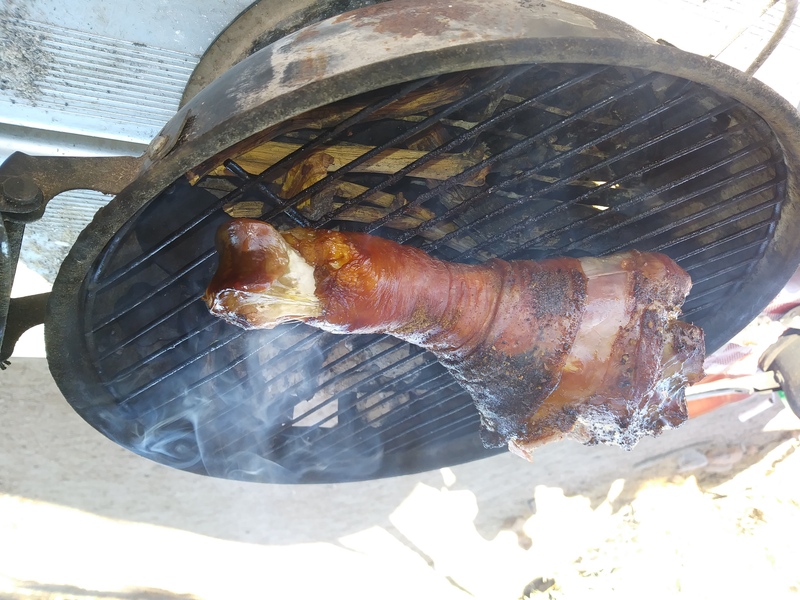 Put the leg on the grill over the smoking wood. Cover. After about 20 minutes turn the leg over. We like to baste the turkey with a mixture of orange juice, orange zest, chipotle powder and melted butter. It adds flavor and keeps the leg moist. After another 20 minutes, the turkey should be done depending on the size. Insert a meat thermometer it needs to reach 160 degrees. Let the leg rest 15 minutes and then enjoy. Note to Reader: If you’re going to smoke a whole turkey, remove the backbone, and wings. The turkey then lies flat and cooks more evenly.